Use the “Auto return serialized rental stock” setting to automatically check-in gear from previous jobs when you scan on a new one. When it’s busy, you might find yourself doing battle with your “Overdue Returns” count on the dashboard as gear comes back and goes out quicker than you can check it in. 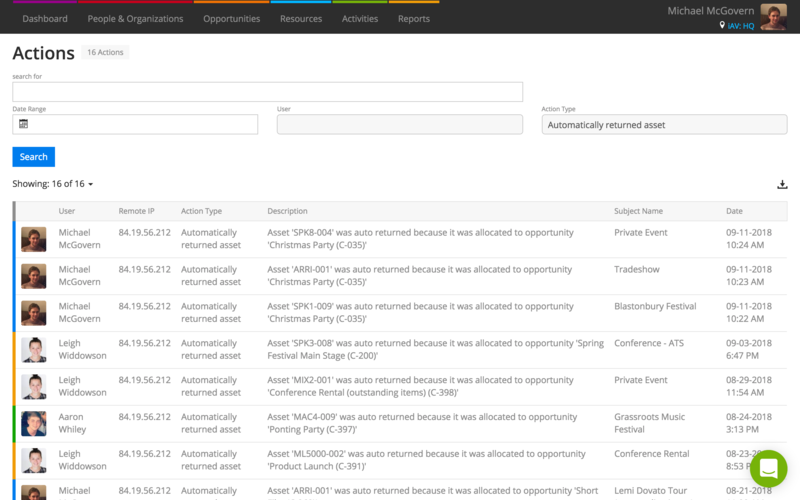 Help tame your returns count by automatically checking-in assets on past opportunities when you allocate them to a new one. 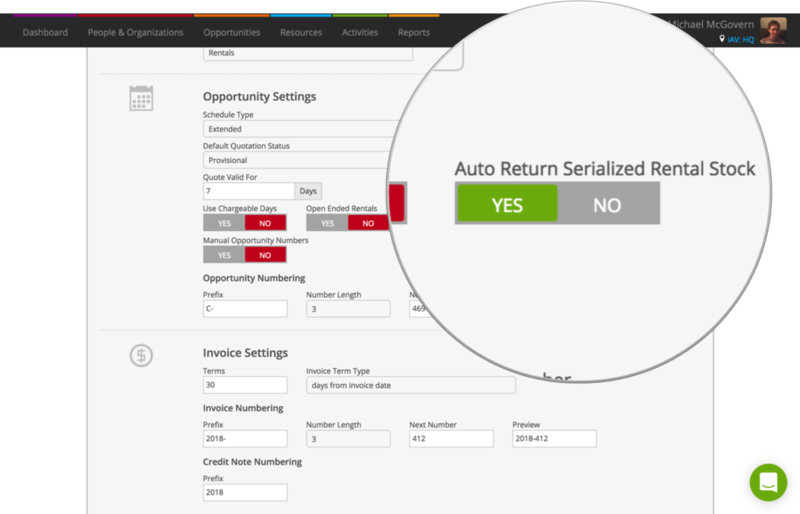 When you allocate a serialized asset to an order or reserved quotation, Current will check to see if that asset is booked out or checked-in on any other opportunities. If the asset is booked out or checked-in on opportunities that started before the opportunity you allocated it to, Current will automatically check-in and finalize it on the prior opportunity. Current creates an Action in Recent Actions, so you can check to see which assets were automatically returned. Where an asset can’t be returned automatically, you’ll receive an email to let you know why. Keep in mind that only the assets you allocate to the new opportunity are checked-in and finalized, existing items on your previous opportunities will not be changed. To enable, head to System Preferences and toggle “Auto Return Serialized Rental Stock” to YES. That’s it! Save your preferences and you’re done. Allocate assets to reserved quotations and orders as you would normally. Current RMS will take care of the rest, automatically checking-in and finalizing assets on opportunities that started previously where the asset was booked out or checked-in. Consult Recent Actions against an opportunity to see if an asset has been returned automatically. Remember, you can use the Action Log in System Setup to see Actions across your system. the asset has been checked-in as damaged or lost on a prior opportunity. the asset is on an active global check-in session. You’ll receive an email letting you know if this happens. Some of my jobs are still open, why? Current won’t check-in bulk or non-stock items, so some items might remain booked out or checked-in on prior opportunities. Review your Overdue Returns to check-in and finalize those assets. Why wasn’t one of my assets automatically returned on an order? Is the date of the opportunity prior to the one you allocated it to? Did you allocate to a reserved quotation or order? Provisional quotations do not automatically return stock. 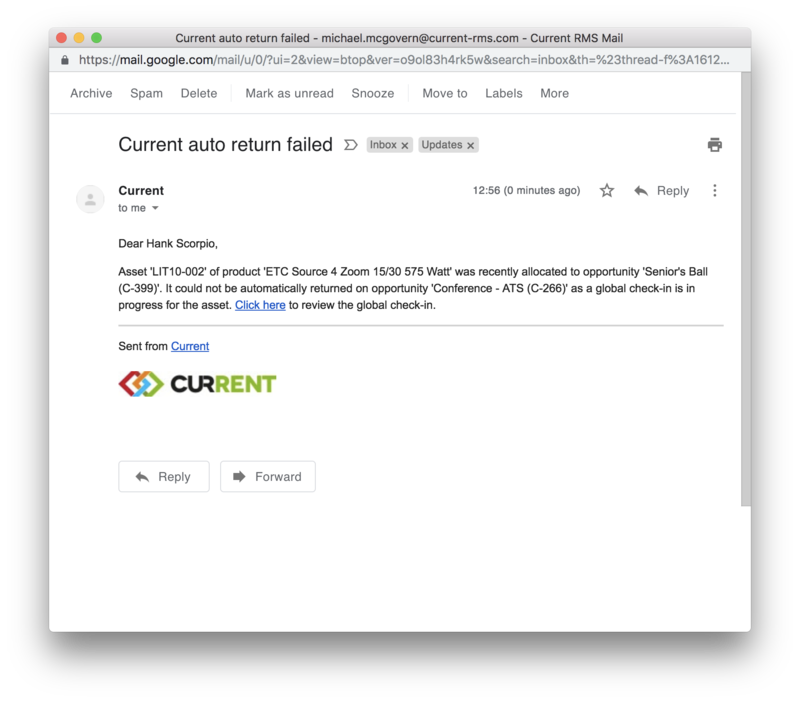 Did you receive an email letting you know that an auto-return failed? Use your Actions Log in System Setup > Actions Log to see all automatic returns across your system.